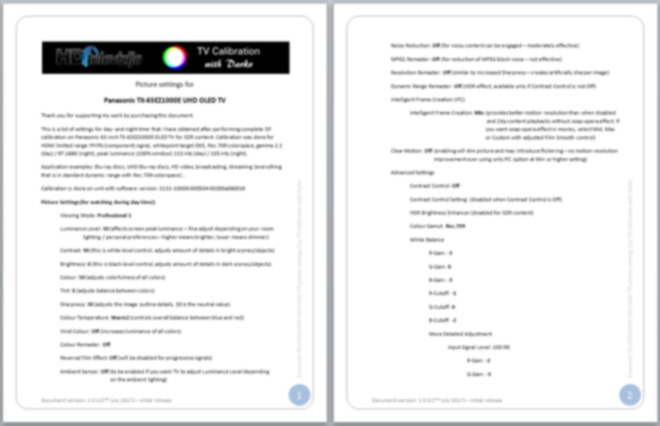 This is a 16-pages long list of settings with tips for day- and night-time that I have obtained after performing complete ISF calibration on Panasonic 65-inch TX-65EZ1000E OLED TV for SDR content. Calibration was done for HDMI limited range YPrPb (component) signal, white point target D65, Rec.709 colorspace, gamma 2.2 (day) / BT.1886 (night), peak luminance (100% window) 215 nits (day) / 105 nits (night). The document also includes tips for watching sports and for HDR content.